Whether you’re looking to downsize (now the kids have flown the nest) or you want to fulfil a lifelong wish and live abroad—there are plenty of options available—you just need to decide what’s best for you. It’s vital you plan beforehand. After all, the last thing you want is to later down the road be unhappy with your new home. 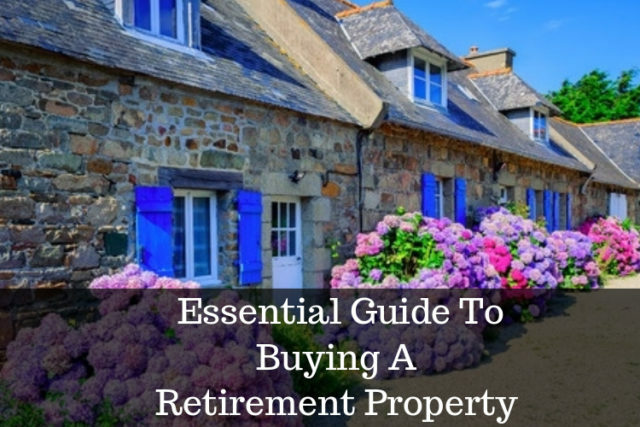 Here’s a quick guide to help you buy your perfect retirement home. If you’re planning to sell your family home or invest your life savings, you need to be sure moving is the right thing for you now and in the future. Talk to your spouse about the move and find out how they feel about it. Together examine the benefits as well as the disadvantages. Do you want to be close to family and grandchildren? Do you want to downsize and use the extra savings to travel or set up a retirement business? Do you need specialist medical care options nearby? Is weather and climate a deciding factor? Do you have mobility issues you need to consider? How important is your support network? This is one of the most important decisions—where you want to move. The last thing you want to do is sell-up and move to a new area only to find you dislike it. Moving to the seaside or the countryside might be sound amazing but imagine how you’ll feel leaving your support network behind. What amenities do you need now and in the future? Do you want to live close to a community, if yes, then maybe consider a retirement village? If you’re searching for a peaceful quiet setting, don’t buy close to a main road or motorway. Don’t just focus on your immediate health, because as you grow older this will inevitably change. When looking at prospective properties, keep in mind your own mobility and accessibility needs. For instance, is there a bedroom and bathroom on the ground floor? Stairs might be an issue later down the line if you suffer from knee or hip pain. Will you have adequate medical care close by? As the saying goes ‘try before you buy’. If you’re planning to move to a new town, region or even country, do a test run first. Maybe rent for a few months or even a year to see if you like it. This will also give you a chance to become more familiar with the local housing market. According to the consumer group Which? the average retired couple in the UK needs around £18,000 a year to cover general household costs like food, utilities and housing (this doesn’t include holidays and leisure activities). It’s important to work how exactly how much money you’ll need now and, in the future, to live the life you want to live during your retirement. Also, it’s worth speaking to an advisor about your finances. What do you need to calculate? How much you can afford based on your post-retirement budget—not by your current income. Monthly retirement income and expenses. If you buy a leasehold flat or sheltered accommodation check ground rent and service charges. Cost of repairs and maintenance. Tax, e.g. will you be liable for inheritance tax. Sure, it might be tempting to use up all your life savings on a deposit, so you reduce your monthly mortgage payments or avoid them completely. Sounds great on paper, but this is a risky strategy leaving you without money to cover emergencies or any other unforeseen expenses. The last thing you want in retirement is to be house rich but unable to afford anything else. Keep in mind that life situations can change, and you may find yourself in a position where you need to sell your retirement home quickly. If you want to move quickly and hassle-free, sell your home to house buyers such as House Buy Fast. You don’t need to worry about what condition your home is, the length of the lease or geographic location putting potential buyers off. Instead, you can put your feet up and have the entire process managed on your behalf. Are you prepared, financially, for your retirement?